Any business environment where physical goods are purchased or sold requires an inventory management system. In accounting practices, two systems exist for inventory management: the periodic system and the perpetual system. What is the Periodic System? The periodic inventory system is based on counting physical stock to determine the costs of goods sold and stock on hand; general ledger entries are made periodically. Since the periodic inventory system requires a physical stock take to determine merchandise on hand, it is suitable for use with small quantities of stock. To determine the value of goods available for sale, take the Opening Inventory + Purchases. To determine the costs of goods sold, use Cost of Goods Available for Sale – Closing Inventory. The system is not suitable for large inventory purchases. Little information regarding inventory is available at any time. 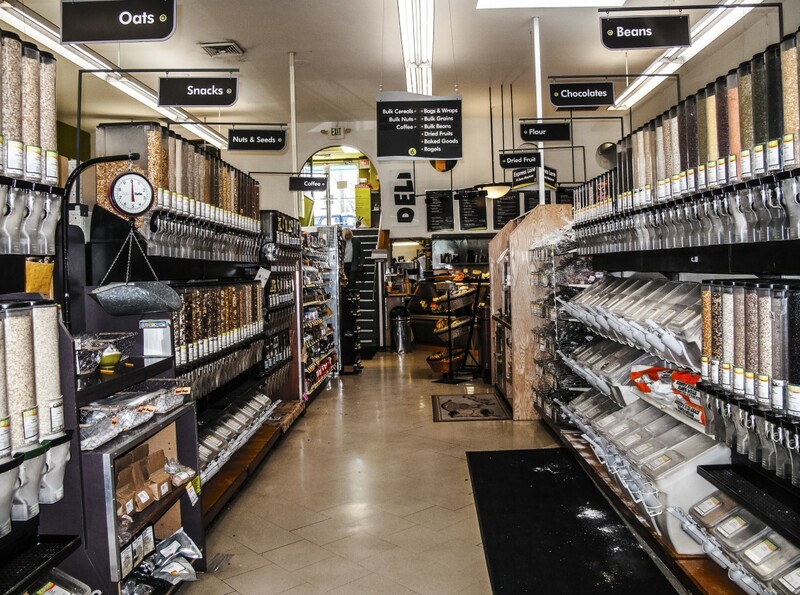 Between stock takes, inventory levels must be estimated and estimates are often different to stock on hand. Obsolete stock and losses is not accounted for until the end of the period. What is the Perpetual System? The perpetual inventory system is an accounting method for companies moving large amounts of stock. The inventory accounts are constantly updated when buying or selling stock. 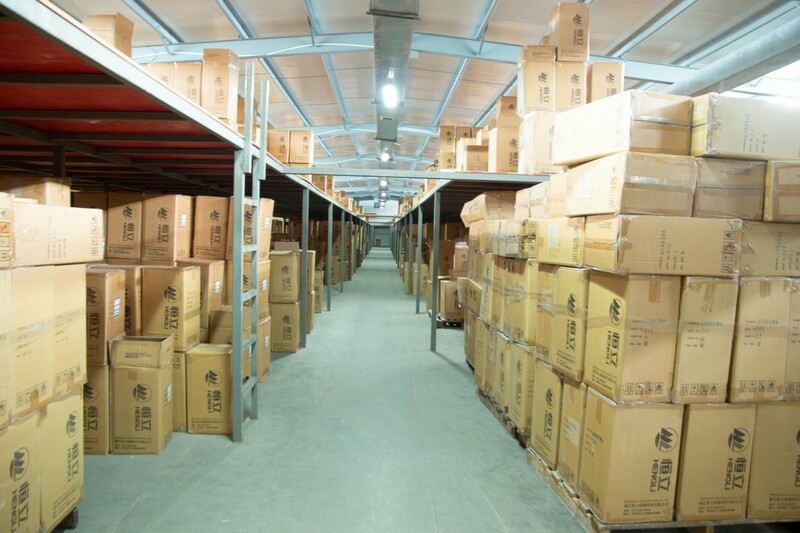 Other movement in stock is also recorded, such as obsolete or damaged stock, raw materials used in production, and stock transferred to a different location. A properly managed perpetual system will provide the user with accurate data relating to stock on hand and cost of goods sold. Physical stock counts will still be required from time to time to determine whether stock has been stolen or damaged. This will ensure that the values in the accounting books are a true reflection of the actual stock available. The periodic system only records the cost of goods sold once a physical stock take has been conducted and general journal entries made; the perpetual system continuously updates accounts relating to stock at all times during the accounting period. With the periodic system, a single entry into a Purchases (asset) account for the total purchase amount is made when inventory is purchased. The individual stock units are not recorded into any item-based accounts. The perpetual system records the total amount of stock purchased, in addition to recording the amount of units of individual items purchased. The transaction can be recorded in a finished stock account or raw materials account. When using the periodic system, a single entry is made when goods are sold reflecting the sales amount. Two transactions are recorded when using the perpetual system, the first reflects the sales amount and the second entry reflects the cost of the goods sold. The periodic system calculates the cost of goods sold when a stock take occurs by using the calculation explained above. A single amount is then entered into the books to reflect the total amount of stock sold during the period. The perpetual system updates the cost of goods sold every time a sale is made, thus creating changes in real-time. For the periodic system closing entries are made to show the total cost of goods sold and to determine the inventory on hand. In contrast, the perpetual system continuously updates the accounts thus no closing entries for inventory accounts are required. The periodic system, which does not record transactions at a unit level, makes it difficult to investigate which transactions contain mistakes regarding inventory; the perpetual system records every inventory unit per transaction thus making it possible to identify errors made with respect to inventory. Financial indicators are important to determine how successful a product is doing and how long it takes to sell a specific item (stock turnover rate). 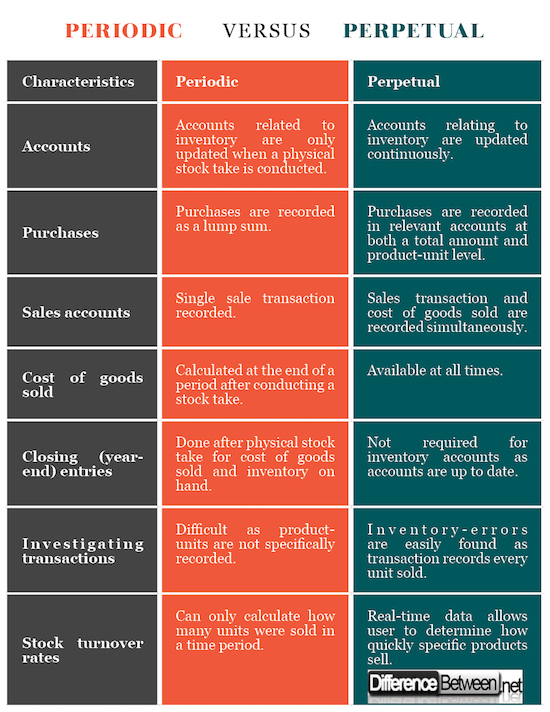 The periodic system does not allow for stock turnover rate calculations as it only records the goods sold at set intervals; thus only an overview can be given stating that a certain amount of items was sold since the last stock take, not considering products which may have been stolen or become obsolete. In contrast, the perpetual system with its accurate stock data allows the user to easily calculate the stock turnover rate for any inventory item. This gives a clear picture of the success of products. The periodic system is for small inventory amounts; the perpetual system is best for large inventory amounts. The periodic system is updated by a physical stock take; the perpetual system is updated continuously. The periodic system is based on total amounts per period; the perpetual system considers individual transactions. The periodic system provides data in retrospect, whereas the perpetual system provides real-time data. Ivannih Jooste. "Difference Between Periodic and Perpetual." DifferenceBetween.net. April 16, 2018 < http://www.differencebetween.net/business/difference-between-periodic-and-perpetual/ >. Bragg, Steven. “The difference between the periodic and perpetual inventory systems.” Accounting Tools, Aug. 2, 2017, www.accountingtools.com/articles/what-is-the-difference-between-the-periodic-and-perpetual-in.html. Dauderis, Henry, and David Annand. Introduction to Financial Accounting. Lyryx, 2017. Online. business.athabascau.ca/assets/Introduction-to-Financial-Accounting-print-text.pdf. Hermanson, Roger H., et al. Accounting Principles: A Business Perspective. Open College Tectbooks, 2011. Online. www.saylor.org/site/wp-content/uploads/2011/11/BUS103-TEXTBOOK.pdf.